Figure 1. Fixed-wing airplane flights are an important way that we detect wolf kills. 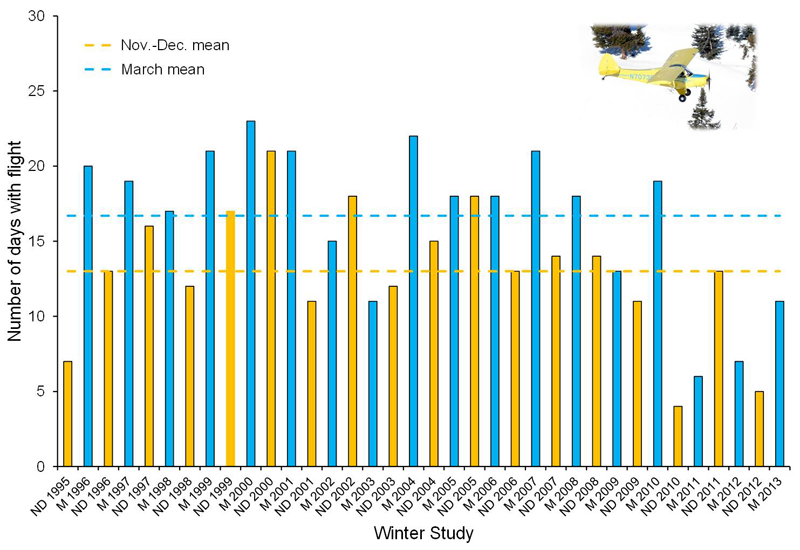 The long-term average for flights has been 13 during early winter study and 17 for late winter study. Figure 2. 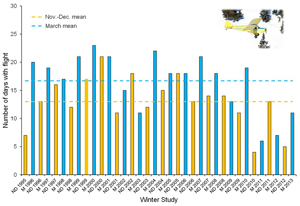 Wolves have been observed by ground crews on ~70% of all days during winter study monitoring periods (the dashed line displays the long-term average). Each circle displays the % of days a particular pack was seen during a single 30-day winter study period and the bold, black dash for each pack displays the average % for that pack. Figure 3. 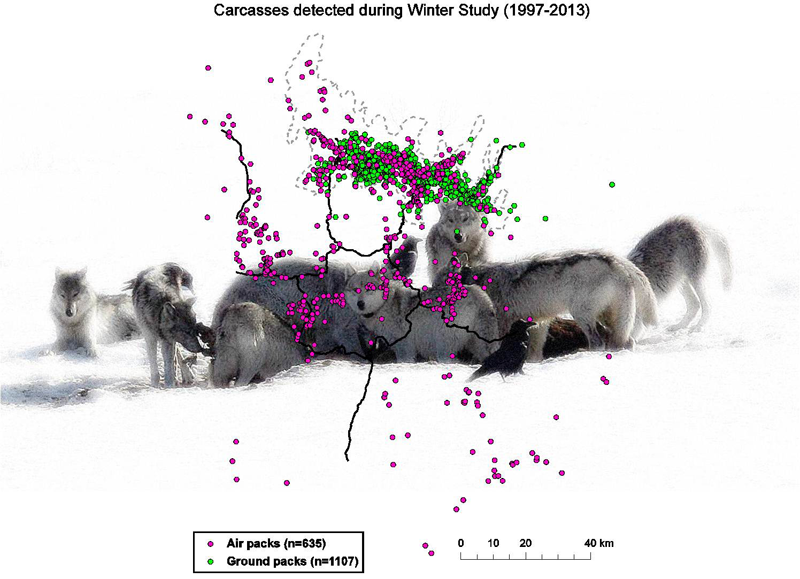 Through the combined efforts of ground and air crews, we detected >1700 carcasses from 1997-2013 for Northern Range and Interior packs. The gray, dashed line represents the Northern Range boundary and the black line shows the main road in Yellowstone National Park. The green circles are carcasses that were detected for packs that were monitored by both ground and air crews, while the pink circles are carcasses that were detected for packs that were monitored by only the airplane. Of note, in the central portion of the Northern Range, the pink circles are covering up many green circles. Figure 4. 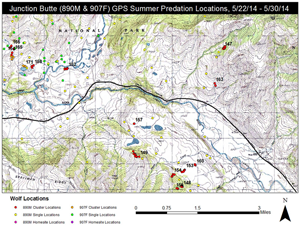 Example of a map displaying GPS clusters. Maps such as this one are produced for 1-2 packs each week throughout the summer. Field crews then hike to each cluster and search all of the locations identified as belonging to a cluster (≥ 2 locations, with each location being within 100 meters of its nearest neighbor). In this example, red and orange circles are wolf locations that would be searched by crews. Such searches have resulted in detecting approximately 600 carcasses from 2004-2013. Predation is a fundamental ecological process, and, therefore, much research has investigated the predation patterns of large carnivores. Wolf predation has been among the best-studied predator-prey relationships of all. This research has demonstrated that wolf predation is influenced by a number of factors, including prey body size and age. Further, wolf predation is also influenced by climatic conditions (e.g., snow depth) that alter how vulnerable prey are to being killed by wolves. Historically, most research of wolf predation has been conducted in the winter, primarily because wolf-killed prey are easier for researchers to visually detect (via direct observation or snow-tracking) and wolf packs are generally travelling together (in the spring and summer, wolf packs produce and care for pups, often leaving the den in smaller groups when searching for food). Although most work has been conducted in winter, recent advances in GPS technology have opened a new window of opportunity to study predation during snow-free periods as well. Research on wolf predation in Yellowstone National Park has been conducted since wolves were reintroduced in 1995. This research assesses wolf predation patterns during two 30-day monitoring periods in early and late winter (mid-November to mid-December and March). Throughout the world, most research attempting to visually observe wolves on kills is conducted from a fixed-wing airplane. In Yellowstone, we also attempt to detect wolf kills from the airplane (the long-term average for flights during each winter study is 15 days; Figure 1). However, because we commonly observe wolves from the ground, we also attempt to locate a few wolf packs from the ground each day during winter studies. 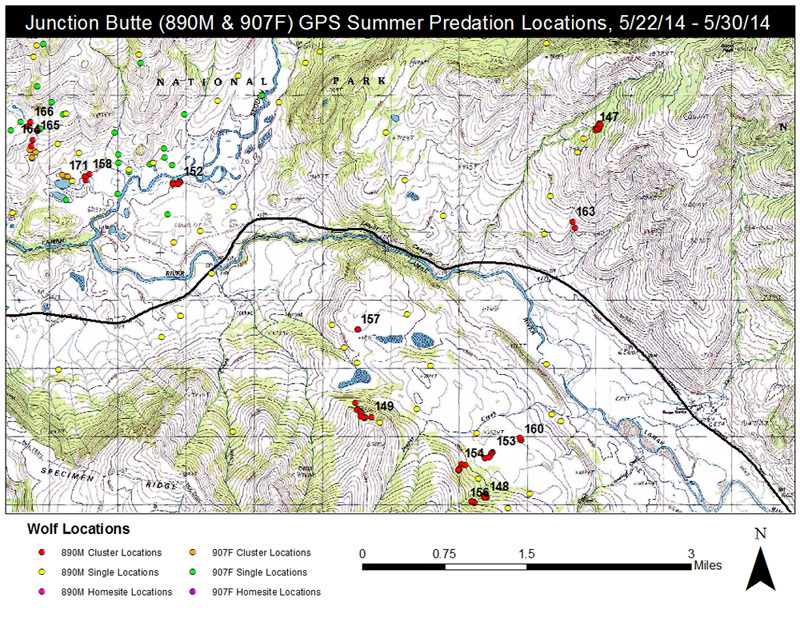 Through this effort, ground crews have located wolf packs on about 70% of days (Figure 2). Today, we continue to utilize these monitoring techniques to assess wolf predation in winter (Figure 3). Additionally, we also began monitoring wolf predation during spring and summer (May-July) in 2004. To study wolf predation in the summer, we deploy GPS collars that collect a location of where the wolf is every 30 minutes. We then download the data from the collar every week and identify "clusters" of locations where the wolf has spent at least 30 minutes (Figure 4). After we identify these clusters, members of our team hike into each cluster to determine if the GPS-collared wolf had been feeding on a kill. 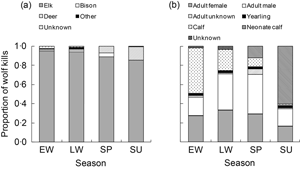 What have we learned about seasonal predation patterns? 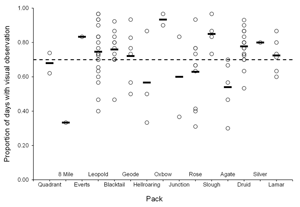 Wolves prey primarily on elk during all seasons when we monitor wolf predation on the Northern Range (Figure 5a). 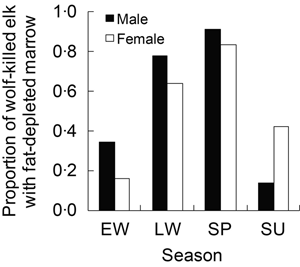 Among elk, wolves prey primarily on newborn elk calves during summer, continue to prey on elk calves during early winter, and prey mostly on adult elk during late winter and spring (Figure 5b) when the adult elk killed by wolves tend to be in poor nutritional condition (Figure 6). In addition to understanding how the composition of prey changes throughout the seasons of the year, we have also begun to understand how kill rate changes. Kill rate is a statistic that describes how often a predator makes a kill and it can be expressed in two ways. First, kill rate can be expressed as the number of prey per predator per unit of time (i.e., day, month, or year). Conversely, kill rate can also be expressed as the biomass of prey per predator per unit of time. Our work has displayed that the impression of how kill rate changes throughout the year can be vastly different depending on if kill rate is expressed in the number of prey or the biomass of prey (Figure 7a, b). 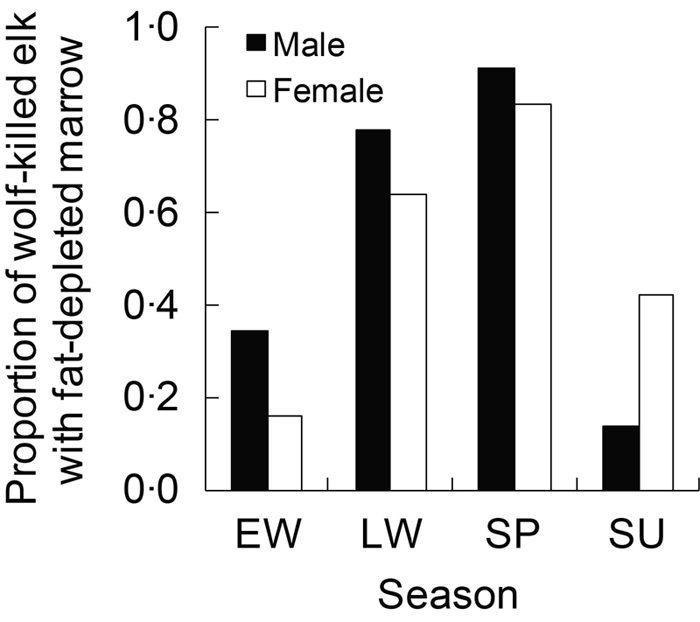 This observation is caused by the average size of a carcass differing between summer and the rest of the year (Figure 7c) and by wolves not being able to kill enough small prey (e.g., newborn elk calves) to compensate for that seasonal size difference in prey that they kill. 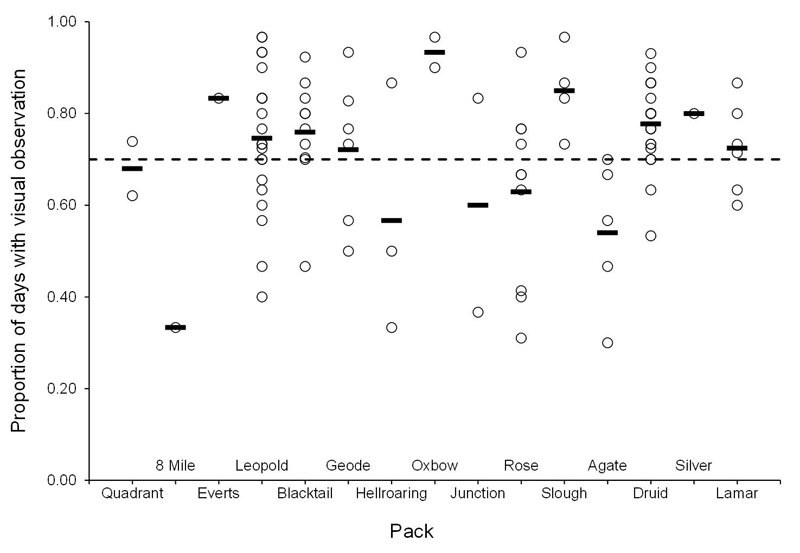 Ultimately, our work shows that summer is the most difficult time of year for wolves (Figure 5b). Therefore, understanding differences in summer kill rates among years may help us better understand annual changes in wolf population numbers. Currently, we are incorporating data collected on seasonal variation in predation to attempt to further understand the influence of wolf predation on elk population dynamics. We are also attempting to assess how seasonal variation in food acquisition may influence wolf population dynamics. Finally, for only summer, collecting data on predation patterns over the last decade has required ~8,000 miles of hiking by dedicated field assistants. Such effort is difficult to maintain each year and we are therefore using the GPS data collected from > 20 wolves to build spatial models that predict wolf kills on the landscape for both summer and winter.